Ford/Motorcraft vacuum advance for 8 cylinder cars from 65/up. I discount these from Ford pricing. These look great ,but are not AUTOLITE pieces. Great for drivers or those not needing concours part. Those that prefer an AUTOLITE part can check further down this same page for restored AUTOLITE units. Here is a very nice replacement oiler for the early ( Pre-'65) Ford distributors. Simple installation. Great detail item. Very nice replacement distributor cap clamps ( sold as a pair) have a slight gloss versus the dull original ones. I can dull them if you want. Look great as they are. Limited supply. First come,first serve. This is a genuine Ford piece I buy in bulk and can save you a few dollars and not have to buy the complete package,like some dealers want. Fit right, best materials. This is a new offering that I have had MANY requests for over the years. This is NOT an original Boss 302 distributor ! This is a custom built distributor to replace and imitate the original C9ZF-12127-E numbered unit. I custom build each one to your specific requests. I pick excellent,used AUTOLITE housings,or BLANK housings with no name or numbers, for both the distributor and the vacuum advance.The BLANK housings have the hole for primary wire in correct location. Autolite housings are off to one side more than original. Please let me know which you prefer.I can install a Pertronix electronic conversion that eliminates points and eliminates the high cost of the rare parts! Please add $70 for the Pertronix upgrade,otherwise a high performance set of points will be included. Point system will include the correct orange boot wire marked AUTOLITE.They are very capable of 6000 RPM. Each unit is tested on a distributor machine to insure proper operation. I have built many of these to meet show use and street use. Once installed the actual ID numbers,or any other date codes,etc. are very difficult to see. There are subtle differences that a concours judge will spot. I DO NOT re-stamp distributors to mislead people. Many fakes are out there at original prices. Fraud in my book. I explain each item and how it affects the look/operation. Cap is not included, but available @ discounted price.Check the pictures of one of my "creations". If you have any comments,I would be more than happy to hear them! I am offering an alternative distributor for those with 1970 428 CJ or SCJ with 4 speed transmissions. Correct DOZF-12127-C distributors are getting tougher to find and therefore more expensive. I custom build each one of these to customer's specs. The one shown here is my best selling unit. A Pertronix electronic conversion can be installed as an option of $80. Has the AUTOLITE vacuum advance with the wide,gold dichromate plating. The advance is fully rebuilt and functional.May have random number on advance housing. The distributor housing has the Ford casting mark,( C8AF or DOZF)but is not stamped DOZF at the top. I do not re-stamp distributors to mislead anyone now,or in the future.Note that the hole for primary wire is correctly located. Once installed in the engine it is very correct in appearance and performance is equal to,or better,than the factory dual point system. I also try to keep a few originals in stock,but the cost is higher,of course. Great for those not needing concours parts! Here is one of my restored Autolite vacuum advance units used on many 1965/ Ford 8 cylinder engines,including the 428 Cobra Jet with automatic transmission. Also used on many 289,302,390 applications. New diaphragm and replated. You will transfer your original internals and vacuum fitting to this unit. Getting tough to find good cores to rebuild and price is sure to climb as supply becomes scarce. Great detail item for that Autolite restoration! Ford# C5AZ-12370-A. I can also supply the early B9AF units! Those are for pre-65 distributors. New reproduction bands for wide band vacuum advance unit! EXCLUSIVE! 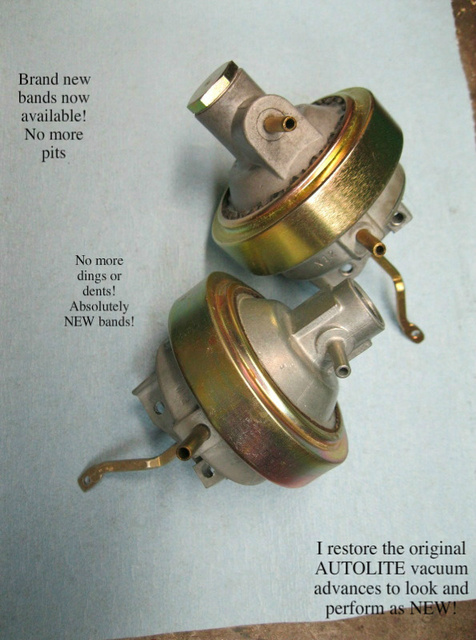 Here is a LONG awaited item for those having their original AUTOLITE vacuum advance units restored by me. Not available A N Y W H E R E E L S E !!! Many original advance bands are just too beat up or pitted ( or both) to be truly show worthy. Correct plating and is used on those restorations where only the best parts are used. Ask for details when having your advance restored by me. Very limited supply. Restored housing with replated band. Both internal diaphragms replaced. Original to both US and Australian applications. Very limited supply . Good used coils that have been hand picked and tested by me. The black body has NOT been restored and the ceramic "yellow" portion is in good/excellent condition. Minimal marking on housing. Some minor marks from being installed.Will need cleaning and detailing to suit your application. From race car to show car these are great,reliable parts. Hard to find today. Older version repo distributor cap. Made in USA.....same country that your Ford was made. Not cheap plastic,but real bakelite with real brass terminals. Aluminum corrodes quickly leading to high resistance and these brass terminals will last many years.I use these on my cars and work great.Brass contacts! No longer produced. Limited to quantity on hand. Copyright 2010 Tim O'Connor Distributor Rebuilding and Restoration. All rights reserved.